Type 45 destroyers: What are the Royal Navy warships and why are they so important? IT’S a fleet worth £6bn and is the vital line in protecting the skies above Britain’s Royal Navy fleet. 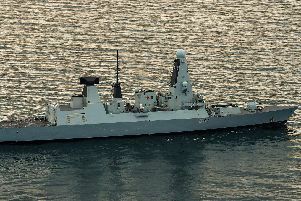 The six Type 45 destroyers are among the globe’s most sophisticated warship – and have been touted by Nato allies as the world’s ‘best’ air defence destroyers. They’re armed to the teeth with the latest weaponry, including Sea Viper missiles, which can travel four times the speed of sound and annihilate aerial threats with deadly accuracy. On top of this, the Portsmouth-based ships can use its powerful 4.5in gun to pound targets at sea and on land, while her Phalanx gun system can spew out thousands of rounds per minute to destroy inbound missiles. And each of the Daring-class vessels can accommodate their own helicopter, with Duncan using a Merlin MK 2. However, the vessels have had their problems. Engine woes have seen them breaking down mid-deployment. Last year, naval top brass was forced to abandon HMS Diamond’s mission in the Gulf after she faced a malfunction in her propulsion system. The Ministry of Defence has already agreed a £160m refit programme to improve the engines of the Type 45s. The major project is being led by defence giant BAE Systems and will see additional generators installed to support the ship’s mighty gas turbine engines.